If you’re a fan of Sony Crackle’s awesomely animated and hilarious stop-motion series SuperMansion, tuning in for the series’ Summer Vacation Special is a no-brainer. Even if you’ve never seen the show before but are a fan of superhero satire, top-notch stop-motion animation, and free entertainment, you can stream the SuperMansion: Summer Vacation Special on their website right now. It’s a nice 22-minute break from your daily routine and even acts a free Hawaiian summer vacation of sorts. In the special, the League of Freedom’s superheroes do all the normal things you do on vacation: They relax at a tiki hut sipping Mai Tais with Barack Obama, attend a high-pressure timeshare sales session with life-and-death consequences, engage in some good old-fashioned American propaganda circa 1944, and accidentally turn the rule of the seven seas over to an underwater villain with a grudge. You know, the usual. 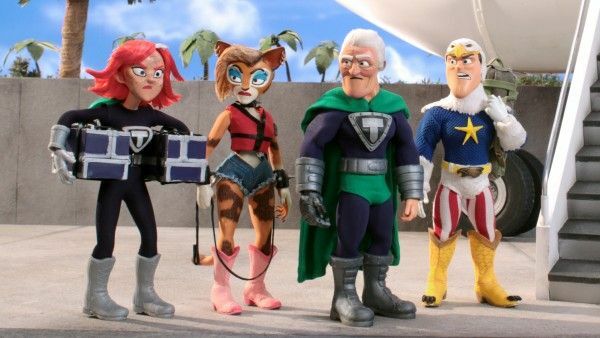 The SuperMansion: Summer Vacation Special is a fun and funny one-off that fits right in with the series’ particular brand of humor and hijinks. Streaming now, the special sees Titanium Rex (Bryan Cranston) taking the team to Hawaii (on the cheap, like very cheap) where he runs into a vacationing former President Barack Obama (Jay Pharoah). Meanwhile, Black Saturn (Tucker Gilmore) and Lex (Jillian Bell) teach Cooch (Heidi Gardner) how to swim (with hilarious consequences), and American Ranger (Keegan-Michael Key) attempts to perform in a USO show, but comes up against some rather stiff competition. Elsewhere, an evil threat brews under the sea in a supervillainous plot that ultimately unites the other side-stories in raucous fashion. Writer-actor Zeb Wells also returns, along with regular player Chris Pine voicing an all new underwater hero, and newcomer Masi Oka (Heroes, Hawaii Five-0) playing the mysterious and tragic Toko. SuperMansion: Summer Vacation Special has everything you’ve come to know and love and laugh at in the Sony Crackle series. It’s a great addition to the canon and a super-fun celebration of summer. And as funny and sardonic as it always is, it’s worth mentioning the continued high quality of the production and the painstaking effort put in by the animation team; it’s really fantastic work all around. Tune in to give it a watch now!